What are lockable poster cases? Standard snap frames are designed to be accessed easily without tools to make poster changes as fast and simple as possible. However, in certain environments posters people can sometimes remove or deface your posters. Lockable poster cases keep your poster safely locked away in a strong case which protects it from being tampered with. How hard is it to replace the posters? Changing the poster in a locking poster case is very simple - you just need the right key. Depending on the style of frame, this will either open the frame mechanism so you can snap in a new poster, or it will allow you to open a hinged door to switch the poster. Where can these locking poster frames be used? 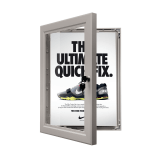 Our locking poster frames can be used indoors and outdoors. They're our most popular poster frames for outdoor use as poster cases protect posters from the elements far better than a standard stand frame does. Some models also include high impact acrylic fronts to further reduce vandalism. As with all outdoor POS, we recommend that you print on waterproof poster paper to protect against crinkling. Our lockable poster frames and cases come in a wide range of sizes, from standard paper sizes such as A4, A3, A2 and A1 to much larger posters A0 and custom sizes.